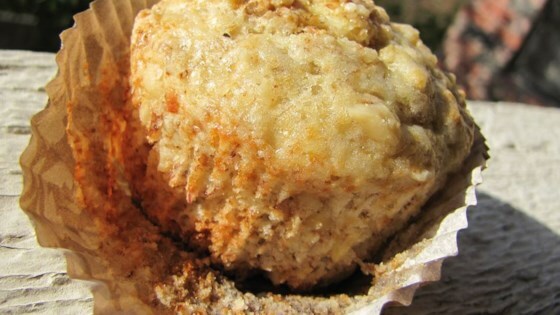 "A banana muffin without the guilt." Preheat oven to 350 degrees F (175 degrees C). Spray muffin tins with non-stick cooking spray. In large bowl, stir together flour, baking powder, soda, and salt. In a medium bowl, beat egg whites slightly. Stir in bananas, sugar, oil, and lemon peel. Add to flour mixture, stirring just until combined. Stir in walnuts. Fill muffin pan cups 2/3 full. Bake for about 20 to 25 minutes, or until tops are lightly browned. Remove muffins from pan. Love, love, love this recipe. Didn't change anything and will definately make again. Thanks for the post. These muffins are really easy to make and very good. I do recommend adding more walnuts then the recipe calls for. And i used one whole egg and one egg white.